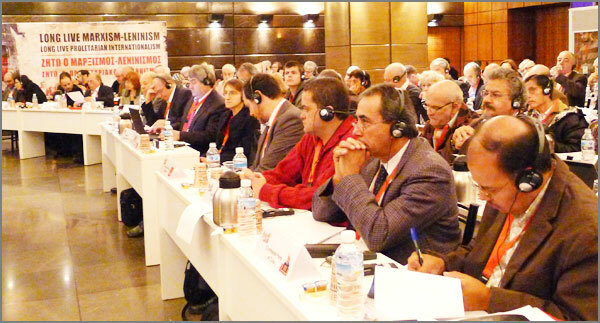 The second stage of the XIV Congress of CPRF was held in Moscow region on December 17, 2011. It was attended by the delegates from all regional party organizations. This entry was posted in CPRF Congress on December 20, 2011 by adm. Statement by the Presidium of the CC CPRF. The last elections to the State Duma were neither free nor fair. We consider them to be illegitimate both from the moral and from the political points of view. The CPRF assesses the results of elections for the State Duma of the RF on December 4 to be a heavy defeat of the ruling regime. This entry was posted in Statements on December 15, 2011 by adm. The international situation and the experience of the communists 20 years after the counterrevolution in the USSR. The tasks for the development of the class struggle in conditions of capitalist crisis, imperialist wars, of the current popular struggles and uprisings, for working class-popular rights, the strengthening of proletarian internationalism and the anti-imperialist front, for the overthrow of capitalism and the construction of socialism. This entry was posted in International Activity on December 11, 2011 by adm.
On December 4-th Russia went to the polls to elect a new parliament. The official results will be announced within a few days. However, it can already be said that the CPRF has substantially improved its results compared with the 2007 elections. Our party will hold 92 seats in parliament (it had 57 seats in the previous parliament). The campaign was fierce and riddled with gross violations of the law by the authorities, anti-Communist pronouncements and numerous cases of vote-rigging. We were confronted by the state machine of Russia, its bureaucratic apparatus, and not the political party that calls itself the United Russia. This entry was posted in Statements on December 5, 2011 by adm.